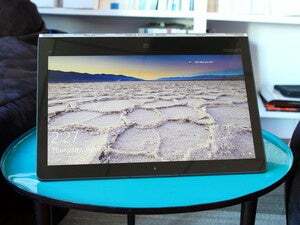 Lenovo improves the premium convertible's famous watchband hinge and prices its configurations from $1200 to $1500. Yes, there's Skylake, too. 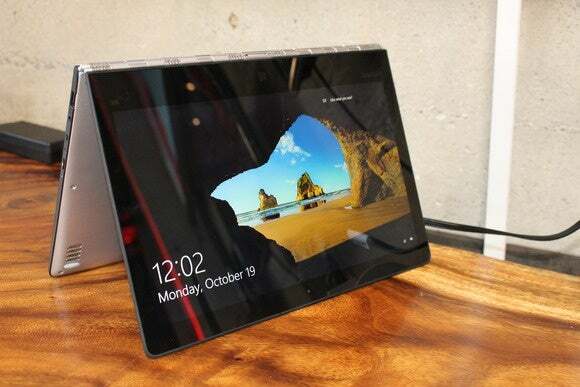 Lenovo’s new Yoga 900 should be one of the strongest competitors against the surprise Surface Book flagship from Microsoft. If nothing else, it has the best answer to the Surface Book’s dual-fulcrum hinge: a strong, elegant watchband hinge, a carryover from the Yoga 900’s year-old predecessor, the Yoga 3 Pro. Crafted from more than 800 individual pieces and capable of 360-degree rotation, there’s still nothing else like this mechanism on any other device, and it remains a standout feature for the now-renamed product line. Lenovo also says it improved the hinge, making it smoother to operate. Lenovo’ s watchband-like hinge consists of more than 800 individual pieces. Not that this laptop is starving for highlights. 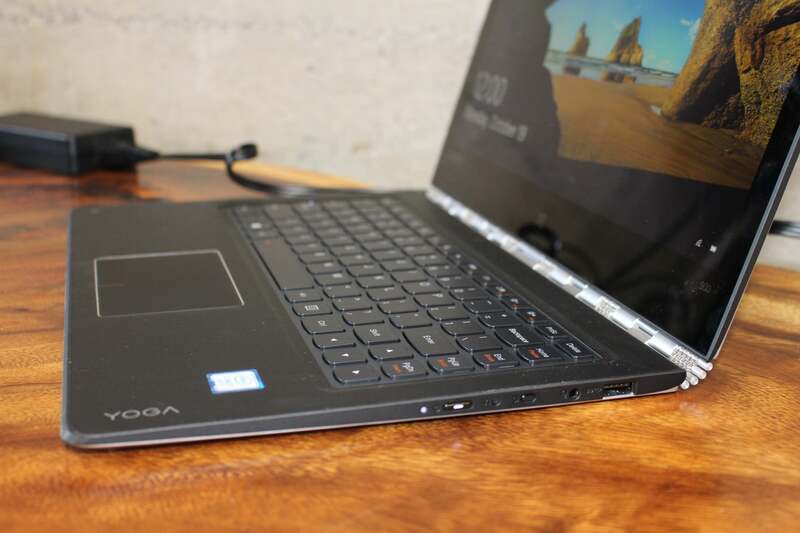 The Yoga 900 is a superslim 0.59-inch laptop weighing a mere 2.8 pounds. Inside, the Yoga 900 will show off all the latest hardware upgrades. Start with the CPUs: 6th-generation Intel "Skylake" chips, either the Core i5-6200U or the Core i7-6500U. 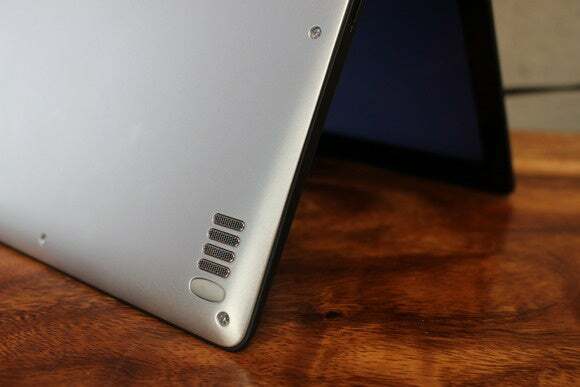 The various SKUs will offer 8GB or 16GB of DDR3L memory, and 256GB or 512GB of Samsung SSD storage. 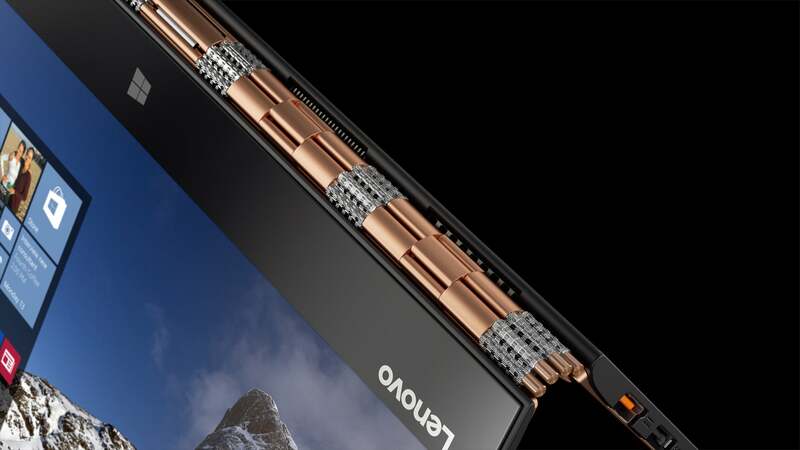 Lenovo's Yoga 900 can sit in tent mode for viewing movies or a digital slideshow. The 13.3-inch IPS display offers a crisp, 3200x1800-pixel resolution (QHD+), 300-nit brightness, and 10-point touch. The Yoga 900 offers only Intel HD integrated graphics. By comparison, the Surface Book offers a discrete GPU on some pricier models. There's also a 1MP front-facing camera. Lenovo claims the battery on the Yoga 900 will last up to 9 hours when playing local video (i.e., not streaming, which taxes your battery). The dual JBL stereo speakers come with Dolby Audio Premium for enhanced sound through headphones. The dual 2.5W JBL stereo speakers don't look like much, but they're supplemented by Dolby Audio Premium, which gives you noticeably better sound through headphones. I experienced a demo at the Monday press event: With Dolby Audio Premium enabled, sound seemed to come from all sides. 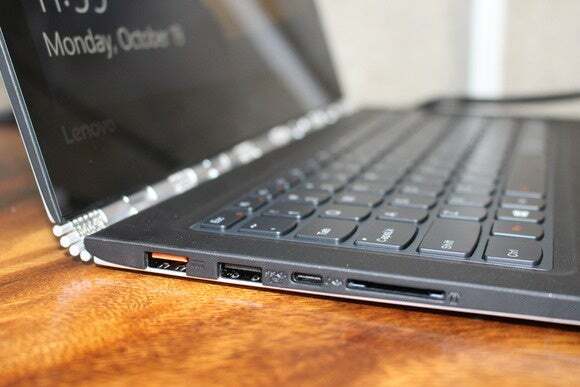 The left side of the Lenovo Yoga 900 has a DC-in with USB 2.0 function, a USB Type A 3.0 port, a USB Type Type C port with video-out, plus a 4-in-1 card reader. Despite the slender profile, Lenovo managed to stuff a decent helping of ports into the Yoga 900. You get an audio combo jack, two USB Type A 3.0 ports, one USB Type C 3.0 with video-out, and a DC-in port that also has USB 2.0 functionality. A 4-in-1 card reader (SD, MMC, SDXC, SDHC) is a nice convenience for loading data or photos. Bluetooth 4.0 and 802.11ac Wi-Fi round out the connectivity. On the right side of the Lenovo Yoga 900 you'll find the power button, an audio combo jack, and a USB Type A 3.0 port. The Yoga 900 will come with Windows 10 Home. 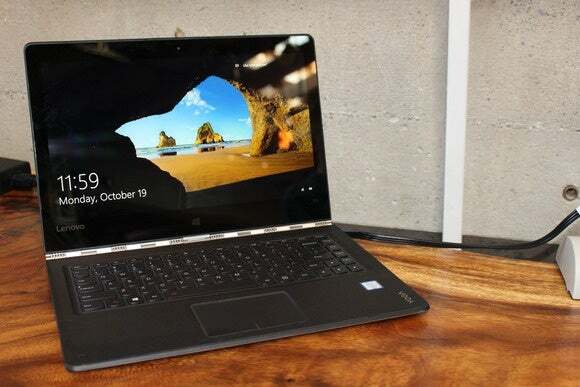 The laptop will be available at Best Buy and Lenovo’s website starting Monday. Prices will start at $1200 and top out at $1500. You even have three color choices: Clementine Orange, Champagne Gold, and Platinum Silver. (Some of the photos in this article show Champagne Gold; the rest show Titanium Silver.) Stay tuned for a review once we get our hands on a unit. Why this matters: Lenovo didn’t know about the Surface Book when it was developing the Yoga 900—no one did. Microsoft’s surprise super-laptop has made an already-competitive flagship market downright brutal. The Yoga 900 lacks the discrete GPU offering on some Surface Books, but it still has a versatile design on its side.